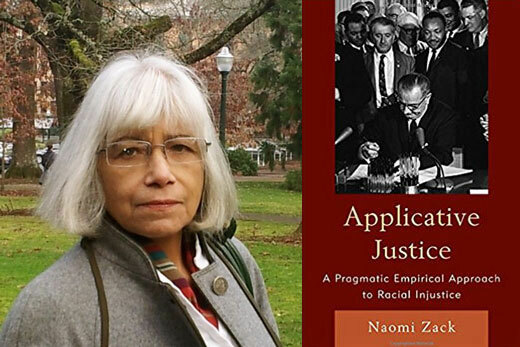 Philosopher Naomi Zack, author/editor of more than 15 books on race and rights, will discuss "Applicative Justice, Race and Mixed Race" for Emory's annual James Weldon Johnson Distinguished Lecture. UPDATE: Due to inclement weather, Dr. Zack's flight was canceled. This event has been rescheduled for Thursday, April 20, at 4 p.m.
Laws do not always ensure justice. And when it comes to racial justice, just law and unjust practice often co-exist. So, what does it really take to correct racial injustice? Naomi Zack's new theory of applicative justice ventures an answer. On Thursday, April 6, at 4 p.m. in Cannon Chapel, Naomi Zack, professor of philosophy at the University of Oregon and author/editor of over 15 books on race and rights, will deliver Emory's 2017 James Weldon Johnson Distinguished Lecture. The talk, hosted by the James Weldon Johnson Institute for the Study of Race and Difference (JWJI), is titled, "Applicative Justice, Race, and Mixed Race." This event is free and open to the public. Register to attend. The annual James Weldon Johnson Distinguished Lecture "is an exceptional opportunity to encounter some of the nation’s most innovative thinking about current racial dilemmas," notes Kali-Ahset Amen, JWJI assistant director. "Our goal is to open up space for the public discussion of bold ideas that challenge what we think we know about race and its operations," Amen explains. "As a memorial lecture, we also believe that the presentation of these ideas constitutes an important intellectual bridge between the scholar-activism of James Weldon Johnson and that of his courageous counterparts today." Starting with W.E.B. DuBois’ contribution to fact-based social theory, Zack will claim that intellectually or theoretically, beginning with injustice is more important than beginning with justice. Her discussion of applicative justice will also serve to introduce injustice theory and its contemporary relevance to political identities. She will consider identities of mixed race in terms of James Weldon Johnson’s classic novel "Confessions of an Ex-Colored Man," and referring to the Obama presidency, Zack will suggest that it may be perilous for African Americans to be represented by mixed-race leaders who do not share their heritage of racism and slavery. Ultimately, Zack intertwines these strands to make the case that, as she puts it, conventional “theories of justice may not be useful or necessary to correct injustice." Students, activists, law professionals, policy leaders — and anyone else interested in undoing injustice in a practical and achievable way — will benefit from Zack's theory of applicative justice. The Laney Legacy Program in Moral Leadership at Candler School of Theology and the Emory Department of Philosophy are major co-sponsors of this program.